Russia, Turkey, and Iran undertake commitments to guarantee peaceful settlement in Syria. 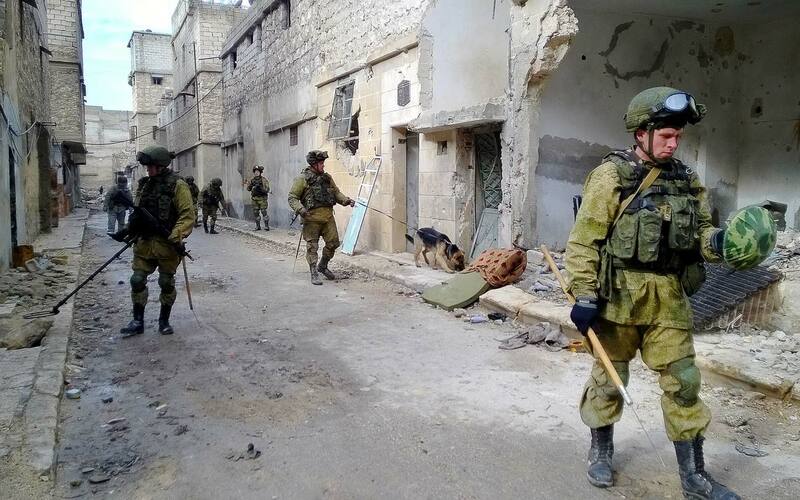 Photo: Sappers of the Russian Armed Forces clear mines in a street of eastern Aleppo. Russian leader has praised Russia's Foreign and Defense Ministries for their work with their Turkish and Iranian counterparts. Agreements have been achieved on a ceasefire regime in Syria and the sides are ready to start peace talks, said Russia’s President Vladimir Putin. "Reports have just arrived that several hours ago there was a development that we all have looked and worked for for so long. Three documents have been signed. A ceasefire between the Syrian government and the armed opposition is the one. A package of measures to control the ceasefire is the other. There is also a declaration of readiness to enter peace talks on Syrian conflict settlement," Putin said at a meeting with Russian foreign and defense ministers on Dec. 29. Russia, Turkey, and Iran undertake commitments to guarantee peaceful settlement in Syria. The deal comes as a result of Russia’s cooperation with partners in the region, Putin said. "No doubt, the agreements reached are fragile and demand special attention and assistance with the goal of preservation and development. But nevertheless, this is a notable result of our joint work, efforts of the Defense Ministry, the Foreign Ministry and our partners in the regions," Putin said at the meeting with the foreign and defense ministers. Putin said the Foreign Ministry and Defense Ministry were constantly in a contact with partners in Damascus and other capitals. "They did a very great job jointly with partners from Turkey. We know that most recently a trilateral meeting of foreign ministers of Russia, Turkey, and Iran was held in Moscow where the three countries undertook commitments on control and guarantees of peaceful settlement in the Syrian Republic."